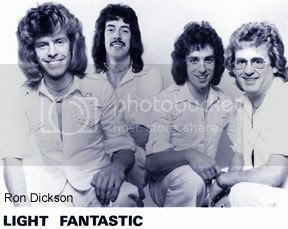 Light Fantastic were well-known throughout the West Midlands during the late 1960s and early 70s while also gaining fans in the rest of the U.K. and abroad. Their exciting and theatrical live performances sometimes featured bass guitarist Ron Dickson’s infamous “coffin act” when he would emerge from a coffin on-stage wearing horrific Dracula or monster make-up, terrifying many in the audience! Still performing today in his own successful “Nightmare” horror stage-show, Ron has kindly supplied the biography of Light Fantastic that I am happy to show here and exclusive to the BrumBeat.net web site. 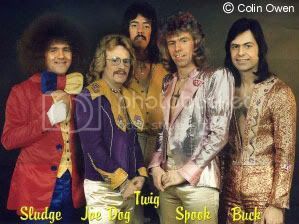 In 1967, the popular Birmingham-based band The Vogues were in crisis as Brian Betteridge, lead guitarist and vocalist left. After advertising and seeing many applicants we took on Keith Locke, originally from Liverpool but living in London and at the time working with a then-unknown band who became Badfinger. Keith moved down to Birmingham and was found a place to live by our manager at the time Den Caney. Shortly after, lead vocalist Johnny Carroll left to go solo as a comedian, followed by drummer John (Steve) Price leaving Ron Dickson as the only original member of The Vogues. The band quickly reformed bringing in Tony Harrison (drums) from Winchester, Richard brown (guitar) formerly with Procol Harum, vocalist Ieuan Thomas from Wales, Keith Locke on vocals and second guitar, and myself Ron Dickson on bass guitar (and the ‘Monster’ in the infamous coffin act). 1968 saw the lead vocalist being replaced by former Finders Keepers’ lead vocalist Roy “Dripper” Kent, a move of home base to Wolverhampton to Join the Astra Agency, and a change of name. ‘Light Fantastic’ were born. Light Fantastic obtained great popularity and notoriety when we accidentally caused an explosion in the dressing room of Pelsall Community Center near Walsall because of the chemicals they were using to create smoke in the horror finale. The story was heavily publicized and exaggerated and the crowds flocked to see us. In 1969, Richard Brown left and was replaced by a friend of Keith’s, Colin Owen from Liverpool on keyboards. Always searching for the spectacular in the stage show often placed us in danger. Tony the drummer was once blown clean over his drums when our roadie wedged the dustbin which we used for the stage explosions behind his drum seat. He escaped unhurt but wasn’t so lucky a second time in the north east, when a piece of cardboard from a stage effect hit him in the rear end so hard that we had to call the ambulance. He was carried off in a stretcher to the ambulance then had to get out and help push it when it wouldn’t start! He spent about 3 weeks lying on his stomach waiting to heal. When x-rayed at the hospital the wound was clean but at the end of the third week a lump of cardboard emerged from the wound like the creature in the movie Alien. Scary! Dripper Kent left in late 1969 to spend more time with his family. In 1970 a new lead singer and front man Ian “Sludge” Lees who had just left The Montanas, joined Light Fantastic. We were whisked of to Hamburg Germany to do two weeks at the famous Top Ten Club in the notorious red light district. Following in the footsteps of the Beatles and many other bands, long grueling sessions playing all night saw us very often sitting in a bar on the Reeperbahn at nine in the morning, having a drink and sitting side by side with all the other night entertainers. A strange topsy turvey world it seemed to be. Nothing but food stalls, clubs, brothels, and all manner of humanity – much of it very bizarre for a young lad and his first time abroad – especially when you pop into a bar and find it full of transvestites before I even knew what one was. The German tour ended with our van breaking down on the return journey and being towed to the port to return home on the ferry in a force 10 gale hanging on for dear life and wading amongst vomit from sea sick passengers. We returned to Wolverhampton with our van being towed the last 200 miles courtesy of “Mad Harry” Jig Saw’s roadie. We were very tired but a much tighter band from our long-playing sessions. 1971 saw another change in the lineup with two new drummers. A short stint with Steve Palmer (younger brother of the famous Carl Palmer of Emerson Lake & Palmer), and then with former Sight & Sound drummer from Birmingham Joe Dignam (Joe Dog as he became known). That year we did a tour of cabaret venues backing and supporting Carl Wayne ex. lead singer with The Move. 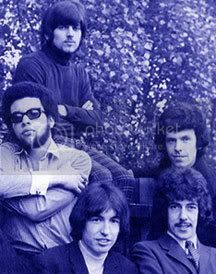 We were trying hard to get a recording contract and did a fair amount of recording with Roy Wood at Lee Sound Studios, Pelsall near Walsall. Finally we clinched a deal with MAM records and released our first single Love Is Everywhere written by guitarist Keith Locke. It was produced by Johnny Worth who had great success with 60’s artist Adam faith. The years that followed up to 1975 were hectic – always chasing that elusive hit record. During this period we released two more records with MAM, the last being Alley Oop, a version of the 60’s million seller by the Hollywood Argyles. We appeared on the pop television program ‘Lift Off’ to promote this, complete with Sludge in a leopard skin leotard and roadie John in a gorilla suit – great fun. In 1973 we did shows with hit band The Sweet, released a record Jeanie on Sweet’s own RCA label, appeared on ‘Opportunity Knocks’ twice, the first time coming second to boy wonder Neil Read who went on to have a major hit with Mother Of Mine. We had people from all over the country voting for us but I suppose we should have realized we were doomed when relaxing in the bar at the studios after our first appearance, we heard Hughie Green discussing what Neil was going to sing the following week. Our second appearance was on the Concorde Special, which was going out on New Year’s Eve in 1973, but unfortunately the show ran over time and we were cut at the last minute. Very bizarre because our name still appeared on the credits at the end. Tours with 70’s hit band Mud in 1974 in major concert venues in the U.K. and Holland gained us more fans. We were promoting our record release on Blue Jean Records Take Me, Shake Me – again a Keith Locke composition. In 1975 we signed with Showaddywaddy’s management and toured with that band promoting our second release on Blue Jean; We Are The Song – a great time with lots of laughs. At the end of 1975, Colin Owen left to get married and was replaced by our roadie at the time Fred Reeves (a good piano player), and then once again more changes as Sludge decided to go solo as a professional comedian. We decided to carry on as a four-piece and quickly settled down with Keith taking over on lead vocals. For the whole of the working life of the band we were working a minimum of six days a week – an indication of a much better time for live entertainment and people’s social life in general. The band or group as we used to call ourselves in those days, carried on recording at Ron Lee’s ‘Lee Sound Studios’ in Pelsall. We released an album (LP) on Blue Records in Denmark where we were very popular as a live act and toured frequently over there. 1978 saw the end of Light Fantastic – a great live act and a great decade. We had run our course for ten years of always chasing that one lucky break during which we had seen fellow local bands rise to fame but it had unfairly passed us by. That year we did many successful farewell gigs, the last being at The Lafayette in Wolverhampton. This was marred by an unfortunate accident involving our roadie at the time ‘Duncan’ ex of the hit band The Sweet. He tried to emulate my infamous leap from the balcony of the Civic Hall in Wolverhampton during the ‘monster’ act by leaping from the balcony of the Lafayette but he tried doing it in a gorilla suit with strobe lights going and under the influence of about eight pints of lager. He mis-judged it and landed badly, shattering the bones in his ankle. We were unaware of this until he came on dressed in a space suit for our rendition of David Bowie’s Space Oddity and fainted in pain. He spent many months in plaster and was left with a slight limp to remind him of his Light Fantastic days. Keith Locke joined up with Johnny Jones (ex Montanas) in a short-lived duo, later going solo and then retiring from show biz to become a very successful businessman. Fred the keyboard player formed ‘Inner-City Unit’ with ex Hawkwind members and carried on gigging into the 1980s. Joe Dog carried on drumming and is still working in a duo, backing artists and doing their thing in summer residences. I carried on doing my thing, jumping out of blazing coffins, fire-eating, performing witch hangings, impalements and other nasty bits, up to this day in the form of ‘Nightmare’ but that’s another story! Copyright 2008 © Ron Dickson. See also www.colinowen.com – the website of Colin Owen – former keyboard player of Light Fantastic. Don’t know if you will pick this up but here goes anyway. I watched LIght Fantastic play a few times back in the early 70’s having met and become friends with Ron Lee. Ron also introduced me to The Montannas and I still have the signed photo they gave me back in 1975. Those were the days, I met a few other people back then such as Roy Wood and Bil Ward. I used to work as D.J. for Brian Thompson in a little club called Eve’s (named after his wife |Evelyn) in Bromsgrove, Worcestershire where I grew up and used to live. Everyone knew Brian back then and his brothers Phil and Clive (they lost their other brother Doug few years earlier). Icould never understand why Light Fantastic never became as big as Slade and T-Rex; The band had it all, raw talent, great stage-show, great songs the works, but somehow the big time eluded you all. I used to work alongside Jimmy Powell back then (as D.J. & compare), Jim even ran the club for a while when Brian was otherwise engaged, I remember Raymond Froggatt playing at Eves and met and had a few drinks with him back then. He was a frequent visitor of the club. I don’t know if you knew Ted Lee aka Big Daddy Lee back then, he was a brilliant performer and a great friend of mine. Heck I could go on forever about those days. I had so much fun and enjoyment watching Light Fantastic. Hope this finds you well and still going strong.